JABARIN WINS 3RD ISRAELI CHAMPIONSHIP: CHUN POONG JHO PAYS SURPRISE VISIT: Ali Jabarin 5d successfully defended his Israeli championship title last weekend in Tel Aviv, scoring six wins to win the title for the third straight year. Daniel Reiter 4d took second and an international participant from China, Jianping Wang 5d, won third place. A highlight of the event was a visit by Chun Poong Jho 8P of Korea, the first time a professional has attended. The surprise visit was arranged by Shavit Fragman, who met Chun when his son Amir Fragman represented Israel in the recent Korean Prime Minister Cup, where he took 24th place – the best Israeli record in this tournament – and was awarded a special prize as the most popular player at the KPMC. 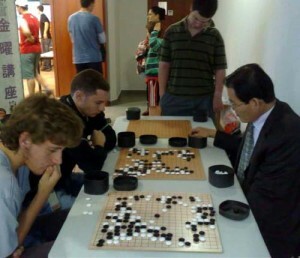 “Chun sensei reviewed games, played simul games and made the event unique and special to all,” Shavit Fragman reports. Click here for reports and photos. CHOI YOUNG SIK WINS AMBASSADOR’S CUP IN BERLIN: Choi Young Sik 3d won the 4th Japanese Ambassador’s Cup in Berlin, October 24-25, his 4-1 score beating Johannes Ebenaus 5d and Alexander Kurz 3d (both of Berlin) on SOS. Of 60 participants no one won all 5. Click here for results. LUETHKE SWEEPS IN KUELUNGSBORN: On the same weekend, organiser Hans-Eckhart Luethke 1k from Schwerin swept his “Go, Urlaub, Ostsee” (‘Go, holiday, Baltic sea’) tourney in Kuelungsborn. With four wins each, Markus Roelz 3d and Volkmar Liebscher 6k (both from Greifswald) also made the podium. Click here for results.